Re-action from the Robert Burns World Federation to the statement by Deputy First Minister Nicola Sturgeon today Wednesday, 18 June 2014 on the subject of Prestwick Airport. The good news about necessary investment in Prestwick Airport is most welcome and a much needed injection of money to address some of the structural and other problems which exist. A low cost or even a no cost suggestion made from the Robert Burns World Federation was to give the Airport a new lease of life with a new name. 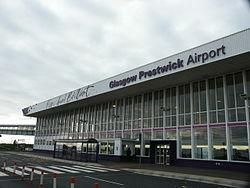 Glasgow Prestwick is a confusing title and will always continue to be so. Following a petition, numerous phone calls, e mails and letters the Federation was backing a new title of The Robert Burns International Airport. A specific name for an airport is not new and hundreds exist around the world which reflect the high esteem in which local personages are held. Named airports are a constant and continuing reminder of real people who have made significant contributions and serve as a memorial today and in to the future. If George Best, Robin Hood and John Lennon are deemed worthy of being remembered the iconic Robert Burns should be remembered in Scotland as he is revered the world over. We may well judge that we have lost this battle but the war to get the name changed does not stop with this rejection. There are MSP’s who are Members of the Robert Burns World Federation and we will be contacting them again on this matter of a new name for Prestwick. Airport will be operated on a commercial basis under public ownership. - DFM Sturgeon said that there would be “no quick fix solution for Prestwick” and the airport might not be profitable for several years.